Yes, click on that. The strange thing is, the light felt far worse (i.e. worse than the same cranes here) when I took this. But it seems to have come out better. More colour on the red cranes. I particularly like the red cranes (see immediately below). I guess the old rule about how you can either have good sky or good stuff in front of the sky still holds. Plus, I think the angles and disposition of the cranes, which change all the time, are even better this time around. 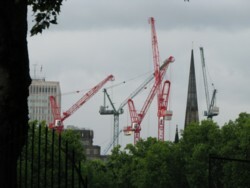 I particularly like how the crane on the right aligns precisely with the church spire.